As our world advances into the digital age, our physical structures are becoming increasingly outdated. A prime example of this is in hospitals: one of the organizations we depend on most as a society. A recent report cites that today’s hospitals are, on average, two decades old. Aging hospitals and healthcare facilities, alongside progressions in technology quickly creates a gap in what facilities are able to support with existing infrastructure and without expensive electrical retrofits. Essential to healthcare are the digital devices that doctors and nurses use to care for and monitor patients — and without the proper infrastructure to support the electrical demands, power is distributed dangerously and inefficiently in hospitals. According to data collected by the U.S. Fire Administration, 22 percent of unconfined, larger and more serious fires in hospitals over a span of three years were caused by electrical malfunctions. Consider the following components of healthcare facilities as areas of improvement in charging technology. Patient care rooms are central to the patient experience. It’s to hospitals’ advantage to make these rooms as comfortable as possible, especially for patients that may be staying for extended periods of time, those with anxiety about medical procedures and everyone in between. The ability to provide plenty of available power sources to keep personal electronic devices powered, like phones and tablets, is a small, yet significant benefit. We know that medical equipment is a non-negotiable when it comes to needing power directly from outlets. Those plugs monopolize available outlets. But, to keep patients happy, facilities want power sources not directly designated for medical equipment. That way, patients’ devices remain charged so they can remain connected with loved ones and the outside world though they’re spending time in a medical facility. The way this power delivery will be accomplished in the future is likely via a wireless power delivery system since plugs are at a premium in hospitals. Think: charging pads or furniture with charging technology. 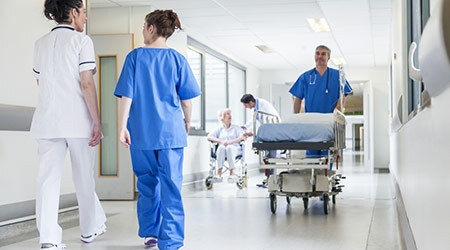 This enables hospitals to forego retrofitting the entire facility with more electrical outlets, rather, using add-on technology to transmit power. This could even become a competitive differentiator for elective medical procedures. As the move to EMRs becomes more prevalent, the need for non-stationary, electronic devices that record patient data increases too. Perhaps the most private and sensitive of the areas for electronic innovation, these devices must remain charged in a safe and secure way. Healthcare personnel never want to be caught in a situation where they need to access a patient’s file right away, but cannot due to a dead device. Even if a device starts a shift fully charged, it can easily burn through the battery, especially if it’s an older device that has a shorter and less dependable battery life. One way more innovative hospitals are combatted this issue is with large charging carts that charge multiple devices at once. This way, there is designated power efficiently distributed for these devices in one convenient area. It goes without saying the level of importance that surgical tools have. They must always be charged sufficiently and have a power source nearby to ensure they are functioning to the fullest when needed. Similar to patient care rooms, operating rooms already have a plethora of wires working to power the equipment. What many may not know is that tools have the opportunity to be charged via wireless charging, similar to cell phones. The use of wireless charging stations eliminates the need to attach devices to charging cords, and tools can simply be sterilized and placed on the charging mat for the next use. This saves outlet space for mission-critical pieces of equipment and alleviates some of the cords that are cluttering ORs. Between 2011 and 2015, fires caused more than $50 billion in damages to healthcare facilities. Power delivery technology is evolving – it’s no longer acceptable or compliant to overload outlets – at risk of your facility and your patients. While our hospitals and long-term care facilities are an average of two decades old, that doesn’t mean that they can’t be modified to fit modern conveniences like power accessibility. In fact, because power delivery is an essential function of all hospitals and many medical devices, considering progressive, safe methods for power transmission is a must for facility professionals. Powering devices in a compliant, safe and price effective way is the way of the future. Cliff Weinstein is CEO and president of FLI Charge.